I lived here for 3 months.It's a great hostel.The team is nice the atmosphere is very good and you meet a lot of great people here. Here you have a family feeling. Thank you for the great time! Really liked the atmosphere in this hostel. 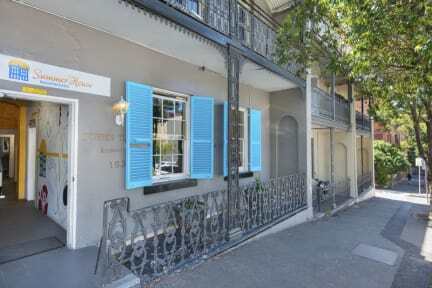 Short walk to CBD, daily events and a nice courtyard to relax. Staff was always helpful and the cleaner are doing a great job. Had such a good stay and would come again! All the people there where so friendly and easy to talk to. The rooms were pretty small but you will learn how to deal with that. The Atmosphere is more like a family and you feel at home. Great location near downtown. By walk, you are in 20-30 minutes at the Central Station and in 20 minutes at the botanic garden. More of a long-term Hostel with a lot of Germans. I had a great time and found a lot of new friends. After 10pm it becomes more quieter. Friendly staff (except some of the cleaners). A lot of long terms because they work in sydney. Location is pretty good. Close to kings cross, but you can walk to the City centre as well. Washing machines are okay (only cold), dryers are s**t. 60 minutes on highest temp. but still not dry. The rooms are okay. Had a 6 bed dorm. Beds were very shaky. Was hard to get on the upper bed. Die Zimmer waren i.O. Das Haus sah etwas heruntergekommen aus. Jedoch war alles soweit sauber. Mitarbeiter waren freundlich und hilfsbereit. Partyhostel - Rooms dirty and cockroaches everywhere... Not enough amentities! The kitchen is too small and always dirty. The atmosphere was bad and no one cares about the others (theft, noisy and no cleaning of their plates in the kitchen). Breakfast was very disappointing as there was not very much to choose (free pancakes on Sundays were ridiculous as you couldn't make them yourself, instead you had to wait 20 min in the queue... Free BBQ on Fridays was even worse!!) Will never come again!!! !